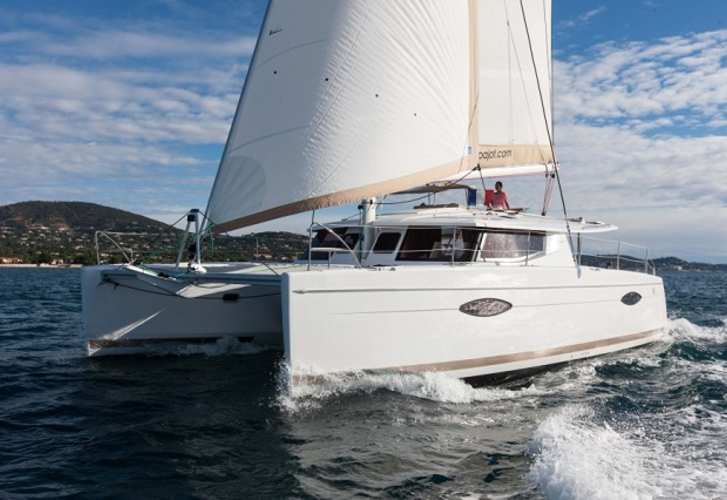 Denizim is a name of sailboat Helia 44 ,which has been manufactured in 2013. You can charter her from harbor Marmaris in region Marmaris. Denizim is equipped with 12 berths. Berths on the boat are arranged in 12 (8 + 2 + 2) scheme. 6 bedrooms are placed inside the yacht Denizim. Browse for other boats in this section: Catamarans Marmaris. Crew members can feel good on this boat , because there are 4 heads for their disposal. With 470.00 l liters in fuel tank you can sail really far and still be independent because of 750.00 l l. in tank for water. Denizim is driven by motor 2x55 hp. Vessel's dimensions are: LOA - 13.30 meters , beam - 7.40 m and 2.00 m of draft. On the yacht you can make use of following equipment: Autopilot, Mobile phone (netted), Gps plotter, Gps, Dinghy, Anchor electric windlass, Bimini top, Teak cockpit, Inverter 12v-220v, generator, Wc pump electrical, Air conditioning, Radio cd mp3, Dvd, TV, Classic mainsail. . Caution accounts for 2000.00 EUR. In our search engine you can quickly check avalailability of sailboat Denizim from Marmaris right here: Catamarans Turkey.